Plans to build one of Europe's biggest wind farms on the Isle of Lewis are set to be turned down, BBC Scotland understands. The BBC's Gaelic news service, Radio nan Gaidheal, has learned that Scottish Government ministers are "minded to refuse" the 181 turbine scheme. More than 5,000 letters of objection to the proposals were received by the Scottish Government. 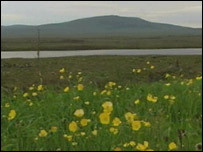 It is believed environmental concerns are behind the decision. An official announcement from the Scottish Government is not expected for a further two or three weeks. A Scottish Government spokesman said: "No final decision has been taken and ministers are working towards finalising and announcing a decision in the near future." A spokesman for Lewis Wind Power said they welcomed the Scottish Government's commitment to make a swift decision on the application. He said: "We continue a dialogue with Scottish Government officials about our application." Campaigners had warned the wind farm would cause "irreversible damage" to one of the country's most important wetland sites. The Royal Society for the Protection of Birds also opposed the project, disputing job figures put forward by developers Lewis Wind Power and raising concerns about the farm's impact on local wildlife. Supporters of the turbines pointed to potential economic benefits, claiming more than 400 jobs would be created during construction. Councillors on Comhairle nan Eilean Siar (Western Isles Council) voted by 18 to eight to support the £500m project in February 2007. But the final decision on the planning application rested with the Scottish Government. The news was welcomed by local anti-wind farm campaigner Dinah Murray, who said the refusal would allow islanders' lives to return to normal. She said: "We are absolutely over the moon. We were opposed to this development from the start on the visual impact, on the damage to the landscape, the damage to the habitat, the damage to the moorland and also the danger there would be on the roads during construction. "This is going to allow us to go back to living like normal people. For four years we have had this sitting over our heads and we just didn't know whether it was going to go ahead or be rejected. "No-one was giving us any indication of how it was going so this is wonderful news." But Angus Campbell, vice-convener of Comhairle nan Eilean Siar, said the decision was a "bitter blow for the Western Isles". Mr Campbell added: "An opportunity to help us revitalise our economy has been lost. "The Comhairle will now engage with the Scottish Government to discuss their plans for how the economy of the Western Isles can be developed. "They must make clear what their vision is for the islands. Are we to become an environmental museum? Is any development at all to be allowed in the Western Isles? "Those who opposed this development must now come forward and outline their proposals for regenerating the economy of the Western Isles."